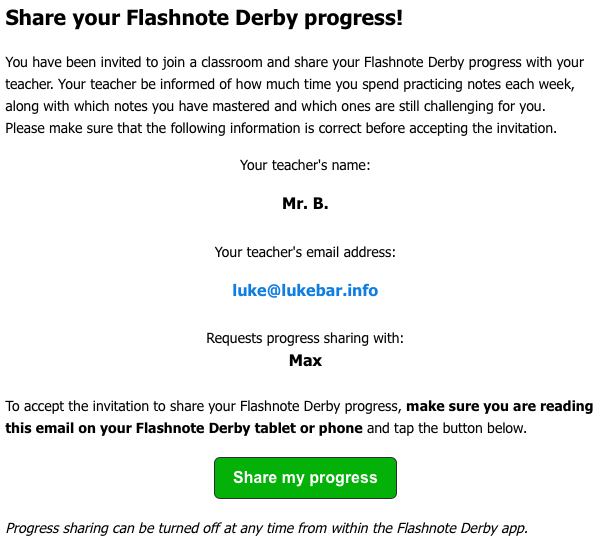 If you are a teacher, you can see your students’ progress in Flashnote Derby even when they are at home or on a different device. Your device must be logged in to a teacher account. Tap the users icon at the top of the screen. Find the user you wish to connect with and tap the info icon next to their name. Tap the sharing icon in the upper right corner of the report screen. Enter an email address that the student can access on their device. Enter your name as you would like it to appear in the invitation email they receive. Once the student opens this email on their device and taps the Share my progress button, your devices will be linked. Data from the student’s device (minutes practiced, percentage of correct responses, which notes were missed, etc.) will be merged with the data on the teacher’s device, and vice-versa. The data you see in their chart on your device will now reflect any Flashnote Derby activity they have completed on your device as well as their device(s) that are linked to you. This information will be kept in sync between all of the devices. 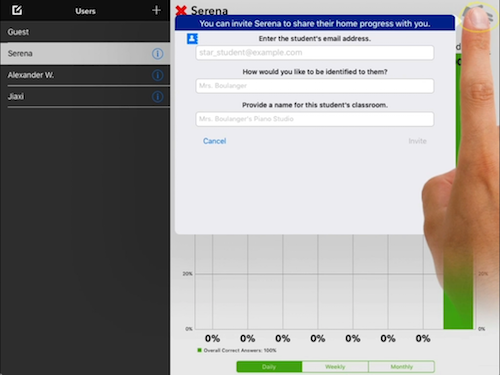 The student’s device must be connected to the internet in order for their progress to be recorded and sent to you. If they play Flashnote Derby while not connected to the internet, their progress will not be recorded until the next time it is online. The data is updated every time you launch Flashnote Derby, but not more often than every 15 minutes. You might experience some delay before the student’s home activity shows up on your device. If a device is shared by more than one of your students, you need to send a progress sharing invitation to each student you want to link with. In other words, if two siblings share an iPad at home and they both use Flashnote Derby, you need to send an invitation to link with each student.